Our black lights are a reliable, economic, quick and accurate anti-counterfeit tool used by banks, financial institutions, retail and restaurant chains nationwide and abroad. All models are designed to verify the authenticity of US currency. 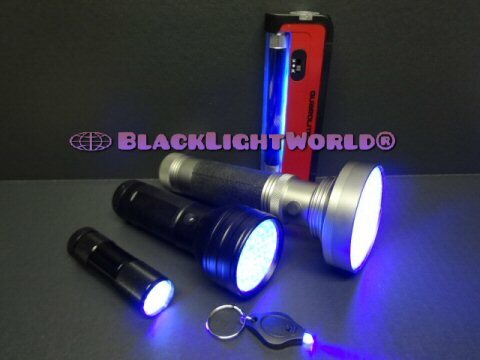 Additional documents such as credit cards, travelers' checks, driver licenses and other ID's can be checked with these economical black lights. A security thread is a thin thread or ribbon running through a bank note substrate. All 1990 series and later notes, except the $1, include this feature. The note�s denomination is printed on the thread. In addition, the threads of the new $5, $10, $20 and $50 notes have graphics in addition to the printed denomination. The denomination number appears in the star field of the flag printed on the thread. The thread in the new notes glows when held under a long-wave ultraviolet light. In the new $5 it glows blue, in the new $10 it glows orange, in the new $20 note it glows green, in the new $50 note it glows yellow, and in the new $100 note it glows red. Since it is visible in transmitted light, but not in reflected light, the thread is difficult to copy with a color copier which uses reflected light to generate an image. Using a unique thread position for each denomination guards against certain counterfeit techniques, such as bleaching ink off a lower denomination and using the paper to "reprint" the bill as a higher value note. This graphic shows the proper colors and approximate location for each strip on various denominations of U.S. Currency. Click on pics to enlarge and see security threads. 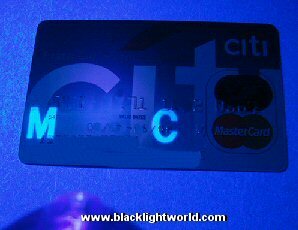 Most credit cards have a hidden ultraviolet security feature that is only visible under the black light lamp. To authenticate, simply place the credit card front side up, under the black light lamp and look for the ultraviolet security feature (s) that appear on genuine credit cards as listed below. A distorted image alerts the merchant of a possible counterfeit card. The merchant can call the credit card issuer, thereby limiting the risk. If an image does not appear, the card may be counterfeit. Discover "NOVUS" logo, newer cards have "DISCOVER"
Diners Club Capital letter "D"
All checks made of Secure paper such as Bank Checks will absorb the UV light. And will not glow. Bank checks may also have security markings that will only be seen under the UVlight. If checks have been washed or chemically altered they may appear lighter in color in the significant areas i.e. payee/signor and dollar amount areas. Traveler's checks will glow if counterfeit, but will appear dull if genuine, just like currency. Traveler's checks are printed with fluorescent signature lines to protect against "washing". If areas of the check appear blue under the black light, it may have been "washed." Most international currencies have security threads, holograms, and watermarks. To authenticate, simply place any of these items under the black light and look for the appropriate security features. The UV properties associated with the driver license will vary by State. More than two dozen State licenses may contain some type of black light property in the laminate that will glow under black light. TO VERIFY: OBTAIN A NEW ISSUE OF YOUR STATE'S DRIVERS LICENSE AND EXAMINE UNDER THE UV SCANNER. If hidden security features are built in they will immediately show up under the light.